Age: 0-7 years. In this artistically painted collage storybook, your child, accompanied by a close one (brother, aunt, parent, etc) discovers the wonders of the garden filled with flowers, unfamiliar animals and insects: rabbits, tadpoles to bright butterflies... encountering many surprises. Age: 0-7 years. 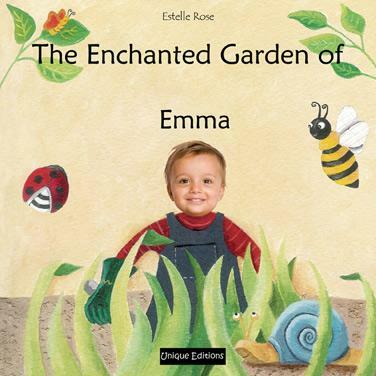 In this artistically painted collage storybook, your child, joined by a brother, aunt, parent or other loved one, discovers the wonders of a garden filled with flowers, unfamiliar animals and insects. There are rabbits, tadpoles and bright butterflies, and they all hold their own secret surprises. Your child becomes a busy bee who needs her loved one to help her to make honey and pollinate the garden flowers. As they work with the insects, they get the chance to look at all the life in the yard through a magnifying glass. Personalisation : The photo of the child appears 12 times and the name 12 times. The photo of the close one appears 3 times and the name twice. There is also an option to create your own personalised message to the child, that appears at the beginning of the book. Book description : 24 pages, size : 20 cm x 20 cm, with thick high quality paper, using professional digital printing and a durable laminated cover. Your toddler is just starting to open her eyes to the outside world. As she learns to identify the plants, animals and insects around her home, this book teaches her all the words she needs to know about her own back yard using personalised books to attract her interest. Eugene Lonesco said, "Childhood is over the moment things are no longer astonishing." Unique Editions has been encouraging that sense of wonder in children through the publication of superb personalised books for children for five years. Their magical impact is seen on the faces of children all over the world. Trying to convince many children to snuggle down with a good book is like trying to convince them to love broccoli (without the cheese sauce.) Unique Editions has searched for and found a solution to this problem. The publisher is unlike others in that every story and image is artfully done by some of the top talents in children's writing and illustration. Since 2007 we have been inspiring children all over the world to embark on a lifetime of passionate reading. From baby books with a good dose of adventure and magic to educational personalised children's books for 12 year olds, every age is catered for. Unique Editions is the first personalised books publisher to place the whole family inside the tale. We also introduced the first educational books to the personalised market.